At about one o’clock in the morning on the twenty-second day of December, an ice storm blasted through Toronto and the surrounding area, turning roads into skating rinks, knocking down ice-covered trees, severing power lines, and leaving an estimated three to four hundred thousand people without electricity and heat. Our neighbourhood was one of the areas that was hit, leaving us in the cold and dark until Christmas day was almost over. There are no coincidences in God’s plans and He wasn’t absent or silent during the ice storm. As in all situations and events of life, the storm provided many opportunities for doing His will, for being a light and a servant to others, for accepting our limitations with humility, for setting aside our distractions and focusing on the arrival of Baby Jesus. In the midst of hardship, we have a very human tendency to justify our self-pity as our plans, emotions, and physical comfort are threatened. In those times, it’s easy to lose sight of our Lord, to forget about trying to do His will, and to turn in on ourselves. But it is precisely in the struggle that we need to look beyond ourselves. Providentially, the ice storm arrived a few days before Christmas when, ironically, a time that ought to be quiet and contemplative is instead fraught with tension and noise. Jesus was all but forgotten as we scrambled to buy the perfect presents, spent too much money, and stressed out all the joy of the season. Then, wham! Ice-coated power lines and downed, ice-laden trees slammed many of us to a full stop. All of a sudden, our families’ and our own safety were more important than anything else. Without laptops and other electronic gadgets, and as we conserved whatever life was left on our phones, we had more time to be present to each other. In our family, we played games by candlelight and had animated discussions that brought out our competitiveness, sharpened our already well-formed opinions, and strengthened the bonds of family. We continued to pray the evening Rosary and Advent prayers even when the Advent candles had been burned down for light. As much as possible, even in the upheaval of our daily lives, it was important to keep the Advent season. It wasn’t easy. 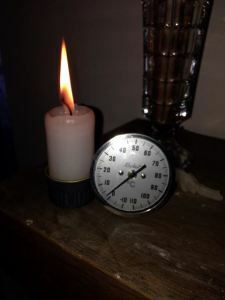 As the day dawned with still no electricity and as we had to pile on more clothing and blankets at night, I found myself easily slipping into frustration and impatience. For the sake of my family and for my own peace, I kept praying for the grace to not sink into discouragement. When we faced the third night without heat and our house couldn’t keep the sub-zero temperatures at bay any longer, we gratefully accepted offers of a place to stay and a lovingly prepared Christmas dinner. As I listened to our Associate Pastor’s well-written homily on Christmas day, I couldn’t help but think how appropriate it was, especially since at that point, my family and thousands of other people were still without electricity. The power and heat in our parish church had just been restored the previous evening, one hour before the first Mass of Christmas Eve. Understandably, it was easy to lose peace and goodwill as the hardship of those few days wore people down. But in the struggle was gift. In the struggle was Christ: the focus, the reason, the God-man, humbled, homeless, cold, yet radiant. Christ was with us in the frigid darkness of a displaced Christmas. In the aftermath of the storm, He reminded us that a dark, cold world is in dire need of the warmth and light that only Jesus can give. Unlike the innkeepers who didn’t help His homeless parents, He expected those who were not affected by the power outage to extend a charitable hand to their brothers and sisters in need. Thankfully, so many people did just that, showing an abundance of generousity and kindness that made the days more bearable. Using an icy blast from nature, He showed us that in spite of our meticulously written to-do lists and non-stop preparations, the control was His, not ours. And with the usual distractions unavailable to us, we were given the time to focus on what is truly important: our relationship with Him and with our brothers and sisters. Looking back, and without any intention of minimizing anyone’s difficulties, there were abundant graces in the ice storm of Advent 2013. They were there for the taking if we wanted them, if we allowed our restless, troubled hearts to seek them out. “Everything is grace,” wrote St. Therese of Lisieux, including ice storms. The greatest tragedy would be if we soon forget the kindness and lessons of the days before and during Christmas. If we don’t learn anything from the experience and if we don’t use our new found insights for good, then those few days will have been in vain. Don’t let that happen.